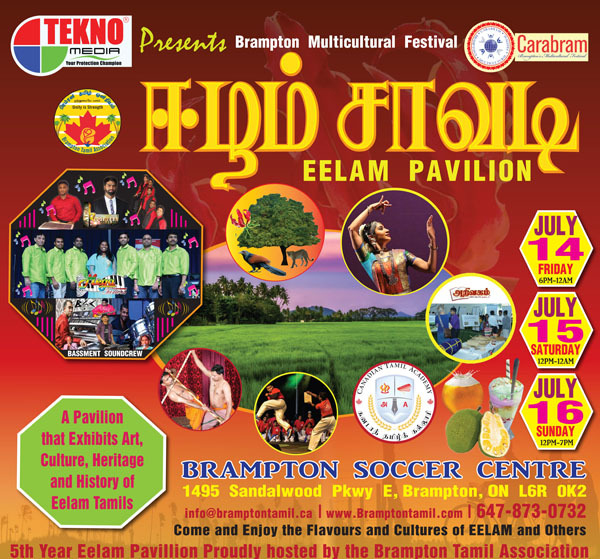 Different cultural events are in profusion all over Multicultural Toronto now and those listed here are free or almost free unless you want to gorge on exotic food and drink. 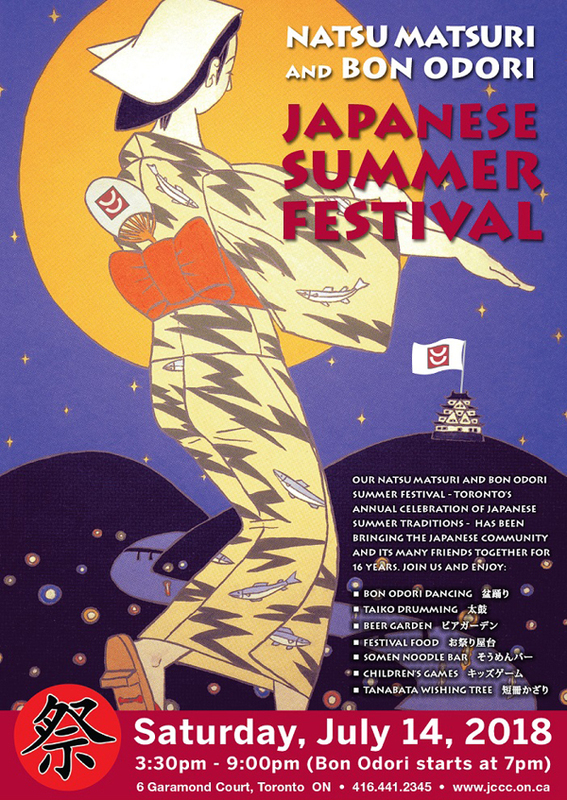 Among the biggest are the Caribbean Carnival, the Asian Night Market, and Japan’s Natsu Matsuri and Obon Festivals where everyone can dance to Japanese music. For a small fee, there’s the many-splendoured Carabram and the Halal Food Fest. 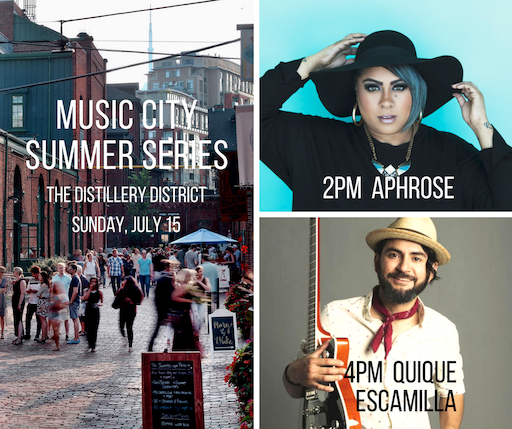 All over the city, we have many free weekly concerts. Look near your home for a mall, a large park, an event space like the Distillery District, where you can relax outdoors or dance – Latino, contra, rumba, swing, Celtic, or whatever. Even Union Station now has daylong live music. 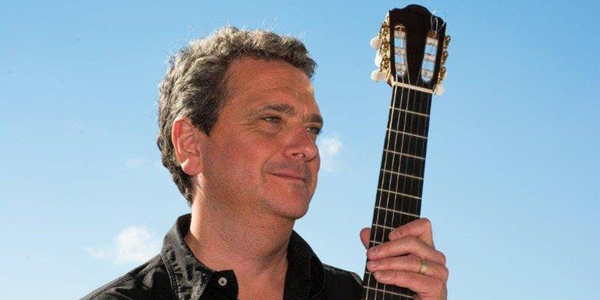 Toronto being what it is will most certainly have performers and music inspired by our culturally-diverse heritages. We’ve mentioned a few below including one centered on the music of only one city – Naples in Italy. The most spectacular and thought-provoking event is a Tamil Chariot Festival. Each Tamil temple seems to have one so if you miss this one, there’s another on another date. During this period, the Orange Lodge with its Dutch/British background will make an appearance, as will Colombian dancers, Egyptians at a picnic, and First Nations artists and performers. France will celebrate its Bastille Day. 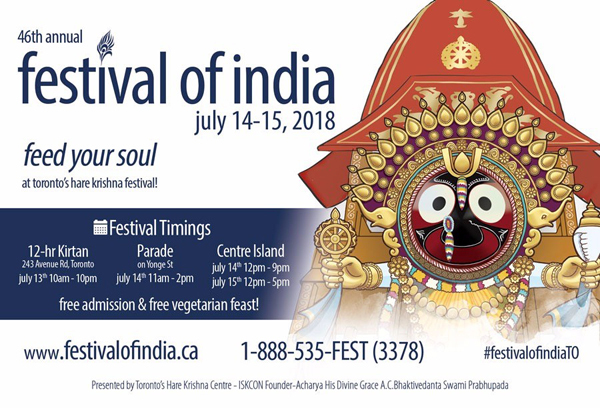 Look for the chariots of the Festival of India as they duck electrical wires down Yonge Street and worshipers continue on to Toronto Island. 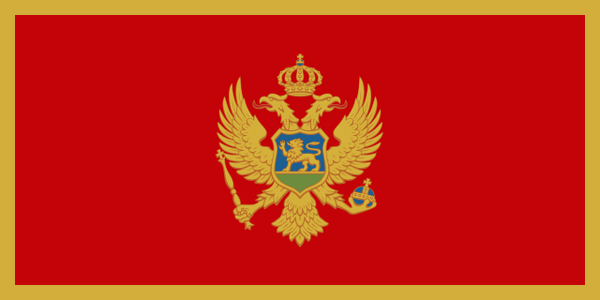 Montenegro, Ireland, Thailand, Nepal, and Hawaii are also among those countries making appearances in town. Everyone will have a chance to meet fellow Torontonians of different stripes. Believe me, the following list covers only the tip of our amazing multicultural offerings – unavailable to you poor people who have to endure long traffic jams and no dishwashers in Cottage Country. We here in Toronto have the whole world to enjoy with just a Presto card. 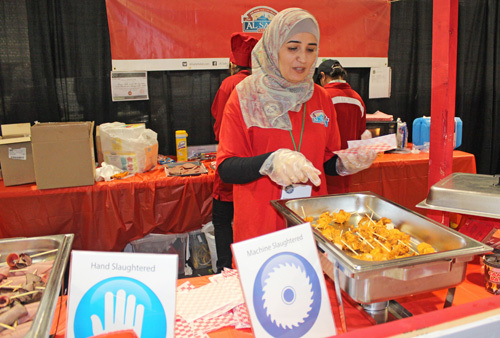 You will probably find me sampling Middle-Eastern food at the air-conditioned Halal or outdoor Middle-Eastern festivals. Alas, some outdoor events might be cancelled due to too much heat, snow or rain. Asia. Night Market. Friday, July 13. 7pm-12 am; Saturday, July 14. 2pm-12 am; Sunday, July 15. 2pm-8pm. Free. Markham Civic Centre, 101 Town Centre Boulevard, Markham. Performances, contests, Asian and other international food for sale. http://nightitup.com. Canada. Toronto. Orangeman’s Day. July 14. “198th Annual Toronto Orange Parade sets off at 11am from the Ted Reeve Community Arena, 175 Main Street. 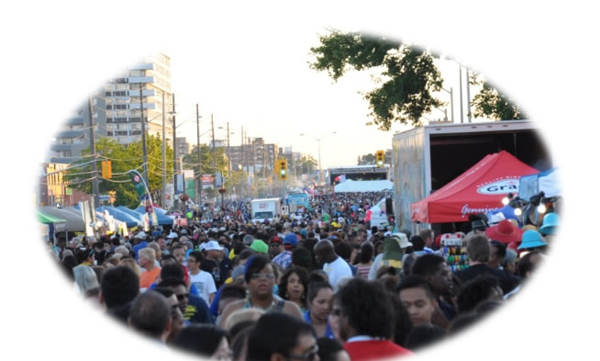 The parade will follow Ted Reeve Dr., Gerrard St. to Main St., North on Main St. to Danforth Ave. East on Danforth to Victoria Park Ave. South on Victoria Park to Gerrard St. and westbound back to Ted Reeve Drive… Following the Parade there will be a BBQ, bouncy castles, bands and refreshments for young and old. The County Master Brother Lynn Barr looks forward to welcoming everyone – members and friends to the longest running such parade in North America. https://www.facebook.com/events/1307972696004093/. July 10. 11am-2pm. Official Launch. Peaks Caribbean Carnival. Nathan Phillips Square. https://www.facebook.com/events/1867663140215268/. Other Events: Various prices and venues. Official Launch, Church Services, Grand Parade (free on Lakeshore Blvd. ), Junior Carnival Parade and Family Day, Carnival Village, Junior Carnival King & Queen Showcase, Calypso Showcase, and Pan Alive. 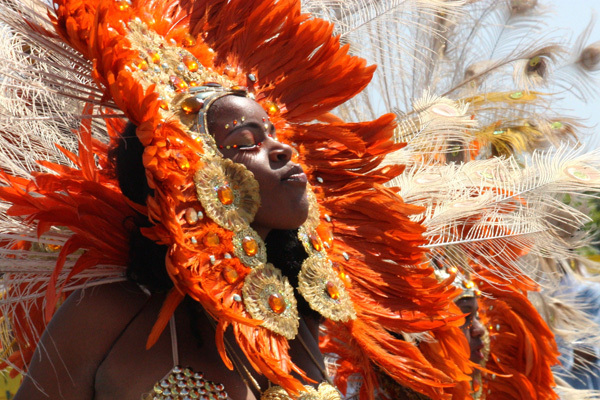 For schedule: https://torontocarnival.ca/event-tickets/. Not to be missed is the Grand Parade. Saturday, August 4. 8:30am-8:30pm. Free if you watch it along its route east from Exhibition Place along Lakeshore Boulevard and return to Exhibition Place. General bleacher seating $10-$20 – recommended for those who want to experience it all and be nearer the judges. VIP $50-$200. Exhibition Place (CNE). Colombia. Multicultural. 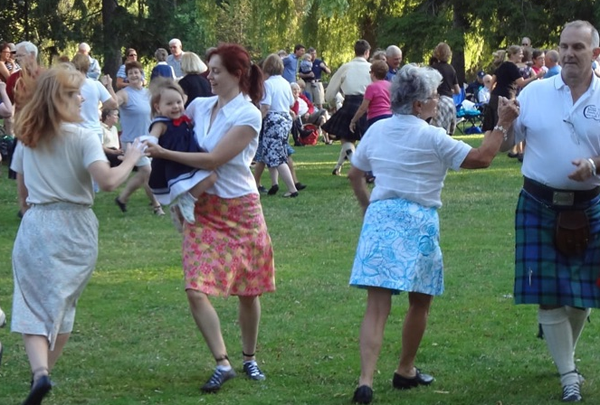 Dancing in the Park: On Stage with Colectro and Noventa Dance Projects. July 14. 8pm. Free. Part of a series of performances and films guaranteed to get you moving. Aga Khan Museum, 77 Wynford Drive. 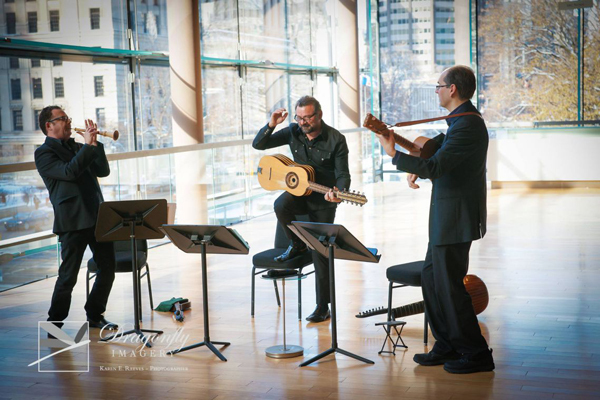 https://www.agakhanmuseum.org/programs/dancing-in-the-park-on-stage-with-colectro-and-noventa-dance-projects. First Nations. Canada. Public Opening. Rebecca Belmore: Facing the Monumental. July 11. 6-9 pm. Remarks at 7pm. Free. Walker Court, Art Gallery of Ontario, 317 Dundas Street West. The Belmore exhibition will be at the AGO from July 12 to October 21. General admission prices apply. “Join us for the public opening of Facing the Monumental the new exhibition by Gershon Iskowitz Prize winner Rebecca Belmore. Celebrate with the artist and a special performance by Cris Derksen, an Indigenous cellist/composer known for building layers of sound into captivating performances. A cash bar will be available all evening.” http://ago.ca/exhibitions/rebecca-belmore-facing-monumental. France. 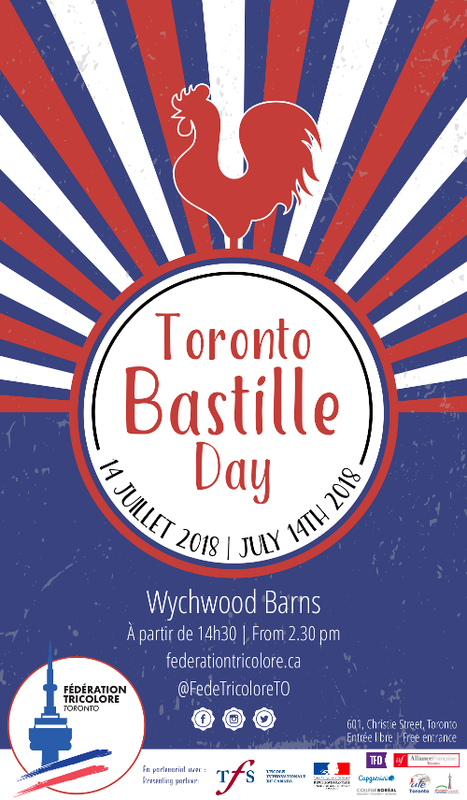 Toronto Bastille Day 2018 – Rendez-vous le 14 juillet! 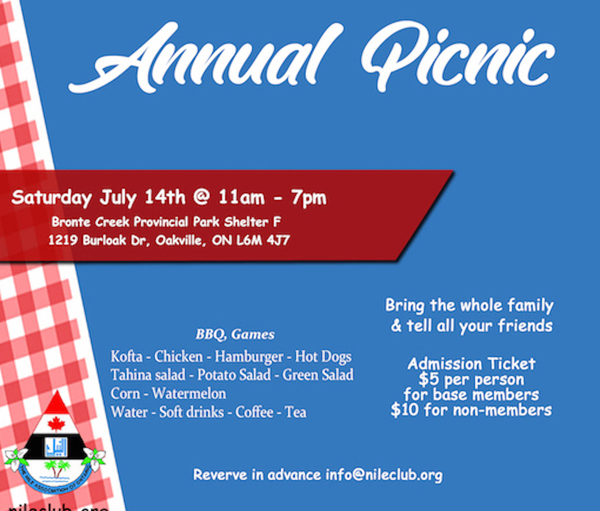 Saturday, July 14. 2:30–9pm. Free entrance. Wychwood Barns Community Association, 601 Christie Street. (map). France. Europe. Mondays. 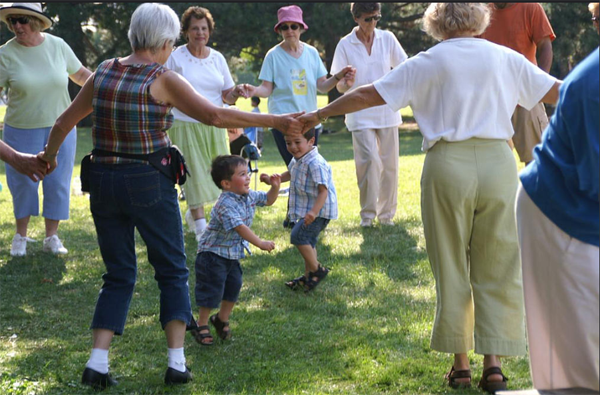 Balfolk (French and western European folk and social dancing) with live music by members of Lemon Bucket Orkestra and anyone who cares to join in. Takes place at La Rev, 2848 Dundas St. W. Musicians come at 7pm, dancers at 8 until 10:30pm. Pay what you can. Check each Monday for updates at www.facebook.com/balfolktoronto. Balfour Dancing. Image Copyright 2018 Ruth Lor Malloy. from website of Istituto Italiano di Cultura. Multicultural. Arts in the Parks. June 15 to September 15. Free. 230 featured events in 35 of Toronto’s parks. Theatre, music, dance, film, and community workshops. 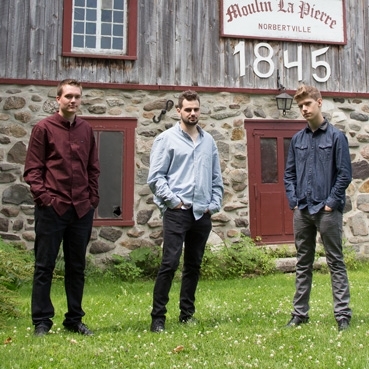 For schedule, performers and venues, see: https://artsintheparksto.org/event-listings/. Multicultural. Harbourfront Centre. This is a place to spend a few relaxing hours with family especially on weekends. A breeze frequently drifts in from Lake Ontario, while there are several things to see or do free of charge: an art exhibit inside the air-conditioned Power Point Museum of Contemporary Art, for example. Live music, dance, workshops, ping pong, space for children to run around, etc. Food, ice cream, and drinks for sale. For a little more, there’s canoeing on the Natrel Pond and boat rides around the harbour. Some of the performances are not free. Just put a date into: http://www.harbourfrontcentre.com/whatson/today.cfm and find out what’s going on. 235 Queens Quay W. Easy street-car ride from Union Station. Second stop. On Thursdays, it has Dancing on the Pier, also for free. 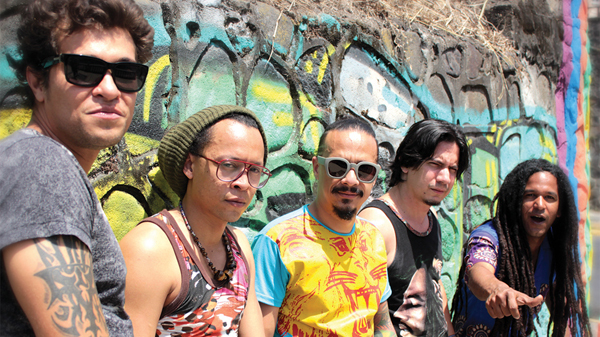 This summer it has Flamenco/Rumba, Latin, Swing/Jazz, Electro-Swing, Celtic, or Latin-Caribbean/Dancehall music. 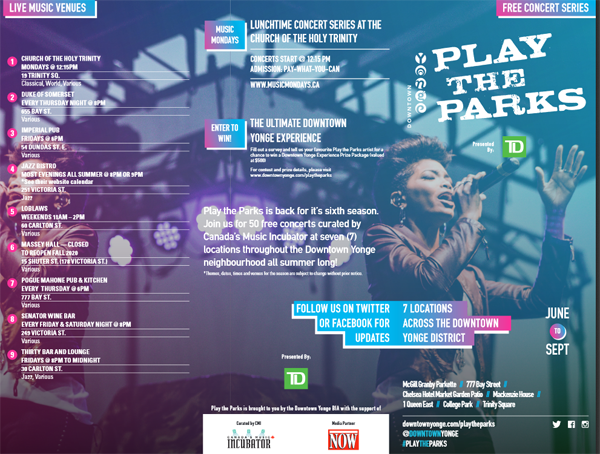 For the band schedule July 12-August 30, see: https://festivalstoronto.com/summer-long/dancing-on-the-pier/. Multicultural. Taste of Lawrence. Neighbourhood street festival. 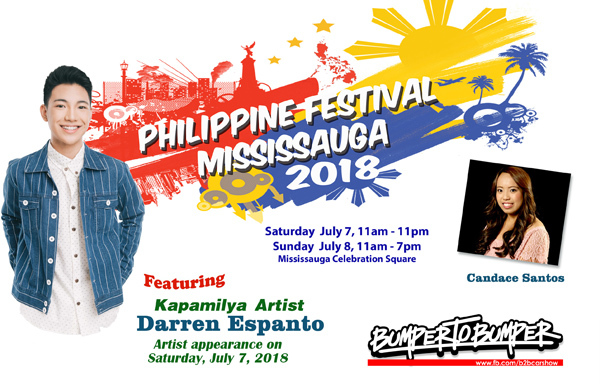 July 6, 6-11pm; July 7, 11am-11pm. July 8, 11am-7pm. Free entry. 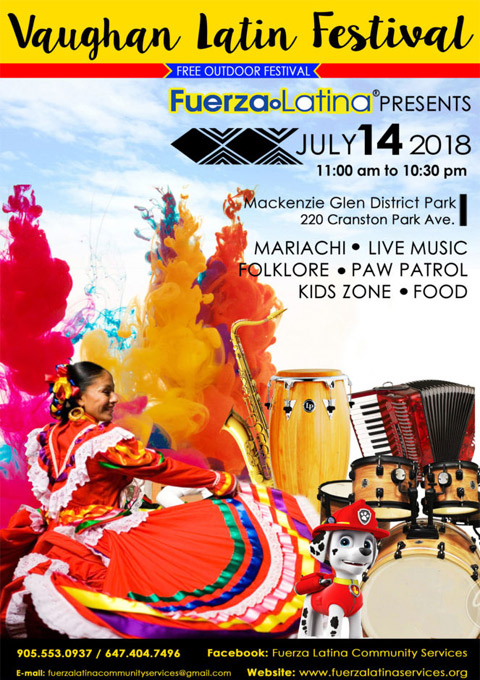 Over 130 street vendors, Midway rides, all day music and family stage with entertainment for the whole family. Lawrence Avenue East from Warden Avenue to Birchmount Road, Scarborough. Http://www.wexfordbia.ca/events/taste-of-lawrence. Multicultural. Union Summer. Now to August 19. 11am-9pm. Free. Sir John A. Macdonald Plaza, Union Station, 65 Front Street West. 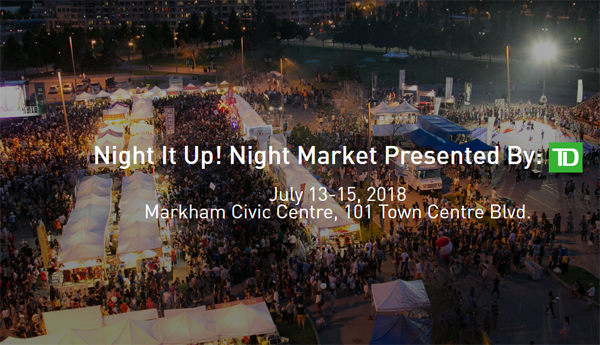 “…an eclectic offering of food vendors, musicians, film screenings and live performances to Union Station… Runs 50 days straight, 7 days a week with free programming on the TD Stage showcasing festival previews, free movie nights, World Cup finals and local arts and cultural organizations featuring the spirit of Toronto at its gateway.” For the daily events schedule: https://torontounion.ca/unionsummer/. RE: If you go to any of our mentioned events, please send us corrections or an account of your impressions so we will know whether or not to promote these events in future. Thank you SO MUCH for alerting me to the event at the Sri Varasiththi Vinayagar Hindu Temple. I loved it. Here’s my account of the event. Maybe you could issue a correction about the date of the actual Chariot Festival. I would also love to have the dates of similar festivals at other temples. Recently I learned, from the Toronto Multicultural Calendar, about a new (to me) procession that takes place at the Sri Varasiththi Vinaayagar Hindu Temple, 3025 Kennedy Road, Unit #10, away out in the suburbs of Scarborough. By the unit number you can tell that the Temple is actually located in one of the units of an industrial complex. Something like the one a friend and I visited during Doors Open a couple of years ago, but much more elaborately decorated, with many statues (Ganesh being a prominent figure) and painted walls and ceilings. The Calendar indicated that the Tamil Chariot Festival would take place today but when I telephoned the temple to check I found out instead that today was the Flag Raising ceremony. The Chariot Festival is Saturday, July 28th. I thought I might as well attend the Flag ceremony today and, after experiencing it, I definitely intend to go back to see the Chariot event. So I headed out for Scarborough this morning, arriving just in time to see the crowds in their saris and other Indian attire entering the temple. By chance I met a member of the congregation, a journalist, who very graciously invited me to enter, remove my shoes, and take up a spot close to the musicians where I could join others sitting cross-legged on a carpet and photograph the ceremony. I think I was probably the only person in the whole enormous gathering who was not from India, but I definitely felt welcome. Marcia, Many thanks for your report. My apologies about the date. I checked with the temple by telephone and was given the date published. It was probably a translation problem. Many thanks for the correction. I will make a correction on my next blog that has a notice about a Chariot festival at another Tamil Temple, one that looks like a temple in Sri Lanka. I am delighted that you enjoyed the festival. Many of my friends are too squeamish to go to a Chariot Festival. I hope I can meet up with you at a festival some day. You sound like an ideal festival-goer.